After just less than an hour drive from Bratislava to Vienna (which seems like nothing these days!) we were parked up, checked in and ready to explore. 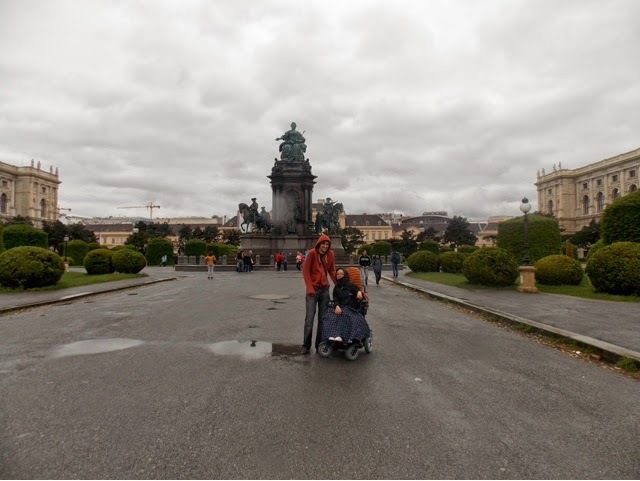 The rain wasn't going to stop us, we were set with waterproof coats and a sneaky hot water bottle in my pocket and began exploring the city. I'm so happy to report that the underground metro, the buses and the land tram are all totally accessible to disabled visitors! We took the metro into the city and were suprised how accessible the station was, a return ticket cost €4.20 return and there didn't seem to be any discount for wheelchair users. 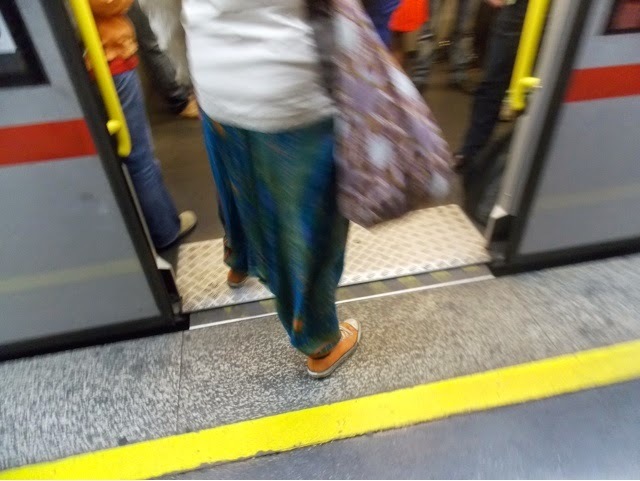 The trains with grey and yellow interiors are newer and have the smallest but most effective ramp come out from under the door to bridge the tiny gap when entering the train. The older trains which have orange insides don't have his feature and have a larger gap from the edge of the platform, so watch out for this. Vienna was wet. Really really wet. But we managed to get around perfectly well, there were dropped curbs are every corner and the slopes were wide. However access to shops and restaurants we found was quite limited, in the evening we could only find one restaurant with indoor seating that I could get into (called 'Gutenberg' and I had a chicken schnitzel, the traditional is with veal but I couldn't bring myself to order it. It was nice, but I don't find schnitzel that exciting if I'm honest). 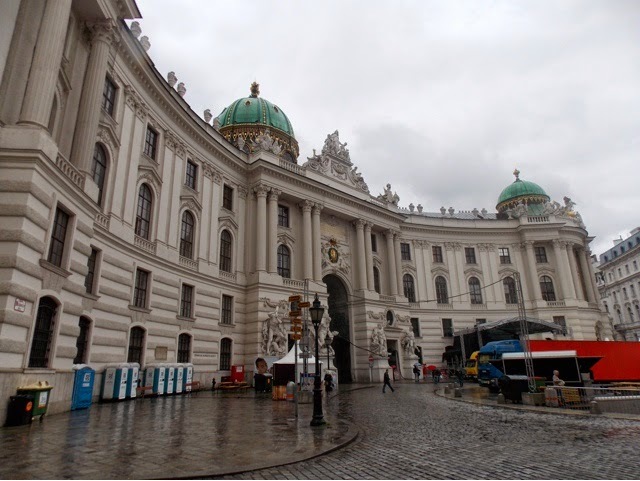 Vienna is cobbled, but it's definitely manageable in an electric wheelchair, it's far worse in South Devon in England than it is here. 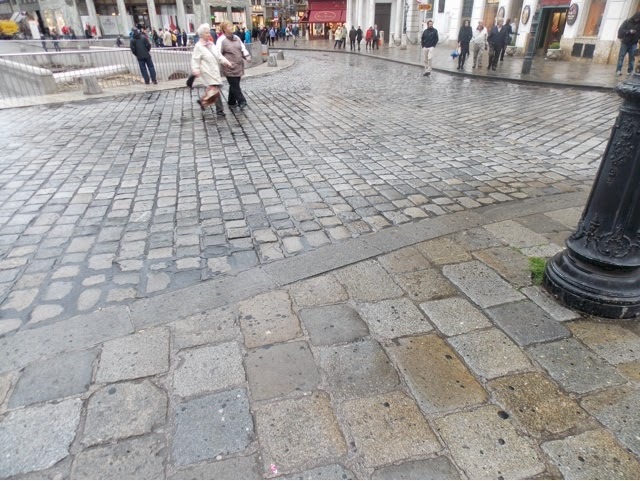 The pavements are damaged Tarmac, the shopping precincts have large flag cobbles about the size of a placemat, and the smaller streets have small arched cobbles. We walked around the Museum Quartier and loved all the architecture, but access again was limited for wheelchairs. I would imagine that the newer museums have access for wheelchairs and the galleries too, but we didn't want to visit them rather the wandering the streets. One museum had a long winding ramp followed by stone ramps which are show below. 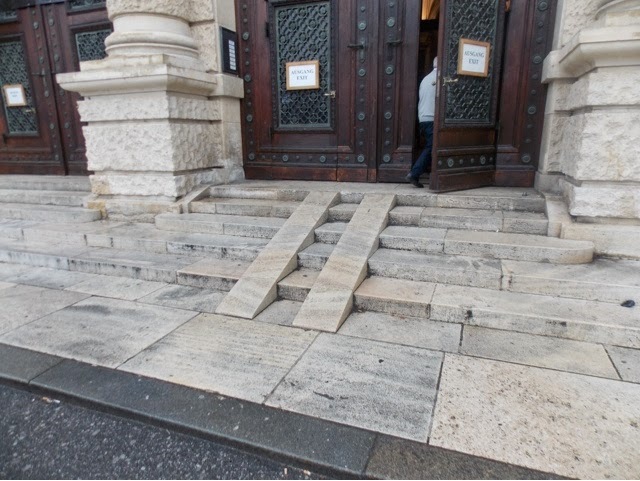 There are three reasons why this is highly unsafe: 1) they are extremely narrow and have no side guides so in wet weather a chair could easily slip sideways, not to mention all wheelchairs differ in width, 2) the rain makes the stone slope very slippery, there should be grip provided and 3) this is actually the exit to the museum and in front of this there is a short platform and then 15 more steps, where a wheelchair could easily slip down the ramp and down the steps in the rain. So as you can appreciate, we didn't go into the museum! 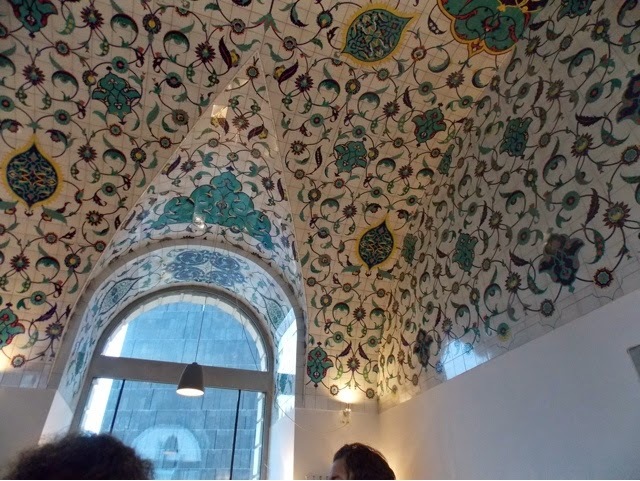 Others were accessible, but we were wet and cold and just wanted to warm up, so we found the cafe to then architecture museum for a hot chocolate "schokolade" and were stunned by its beauty, if you get the chance, please visit, it's a little pricey but the room is beautiful! Our hotel is called "Hotel Delta", which is set outside the city centre, but 3 minutes from the closest underground metro so it really isn't a problem. The disabled triple room that we have is extremely spacious but we have had to bump the bed up with blocks to allow the hoist to fit underneath it. 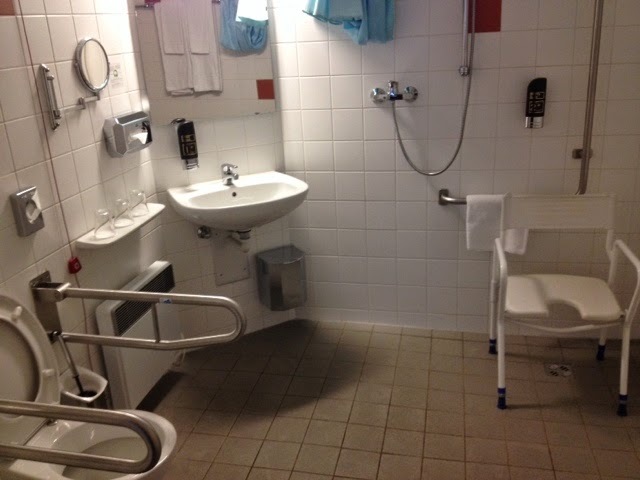 The bathroom is big with a shower chair wet room and high sinkbowl, with an emergency pull cord too. 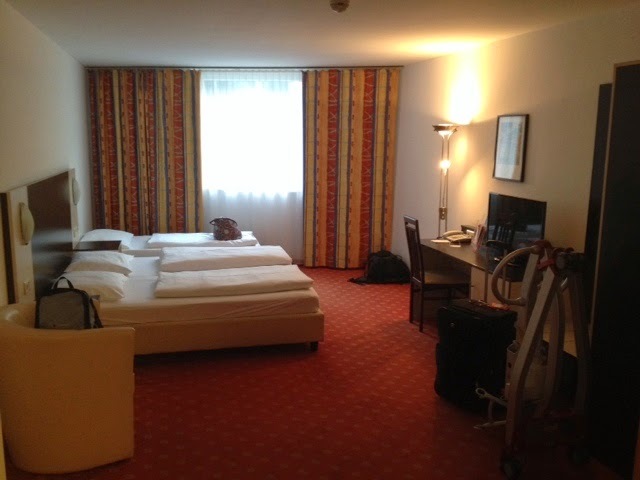 I'm happy with the room and the hotel was a good price for our quick visit to Vienna, I would recommend it for other disabled users for sure.